22 "/ 55 cm from head to toe, with Gentle Touch vinyl head and limbs. 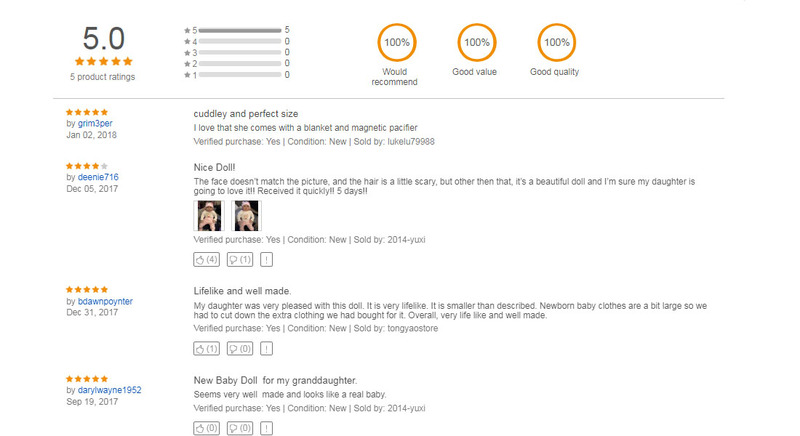 This reborn dolls wear real baby clothes size "newborn" or "0-3 month". Vinyl silicone material for head, 3/4 limbs, Conforms to the safety requirements of EN71 EU standard for ages 3+. Main body part is made of stuffed cotton cloth for soft and warm touch feel.She could not be washed into water. Hair can be shaped after you wash and dry it natural. Please use metal comb prevent knotting. * 1 Piece Baby Clothes. 1. We ONLY take PayPal, other payment methods are NOT accepted. 2. Payment MUST be made within 8 business days after the end of the auction, Or unpaid dispute will be filed to eBay for the non payable bidders. 3. Delivery to the remote area like Alaska,Hawaii,Puerto Rico,APO/ FPO only support Postal service, NO FASTER SHIPPING. If you Pay means you agree with the postal service. Thank you for understanding. 1. We ship to your order address ONLY. Please make sure your shipping address before you pay. 2. Item will be sent out within 24-48 hours after clear payment (excluding weekend & holiday). 4. Shipping time is only estimated and not guaranteed. If not get item after 30 days, please contact us for solve. 1. 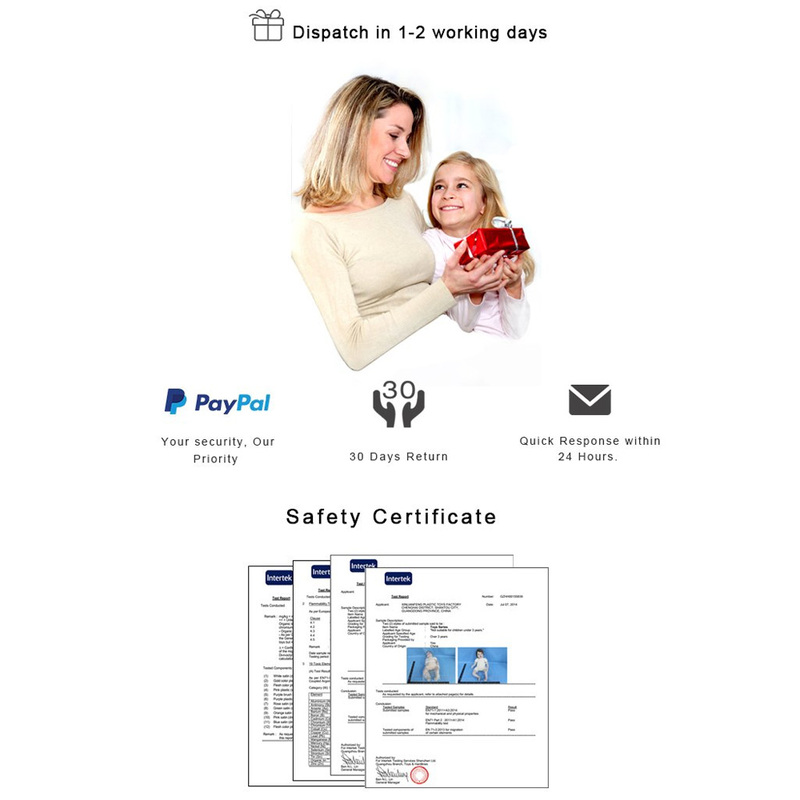 We can exchange the item within 30 days after you received if it is defective. 2. Returned item must have all original packaging and accessories. 3. We would like to pay the return postage if there is any quality problem. 4. It may take up to 5 business days to process your return after we receive your product. 5. If you don't like the item, you can return it to us, but in original box and pay for the shipping postage, we will refund you the item value after we receive the item. 1. We will send it as personal gift with low value. But we wouldn't pay any tariff in your country. 2. If you are satisfied with our service, please leave us a 5-star positive feedback. 3. We will automatically leave a positive feedback to everyone shopped here and left us positive feedback. 4. If you have any questions please contact us before you leave us neutral or negative feedback, we will try our best to resolve the problem, since negative feedback won't help with your problem. 1. We are committed to offering excellent customer service. 2. If you have any questions about your doll or require other assistance, please contact us during regular business hours to answer your questions. 3. Due to the difference of time zone, sometimes the reply to your message will be delayed with 24 hours(excluding weekend & holiday),Please understand, thank you.